Avete mai riflettuto sull’importanza dell’olio extravergine d’oliva nella nostra cucina? Io dall’olio, quello buono, sono seriamente dipendente. Per condire, insaporire, ma anche semplicemente da assaporare sul pane caldo, mentre al ristorante aspetto che arrivi il mio piatto. Non vi dico il dramma quando all’estero mi portano quelle salsine pasticciate per condire l’insalata… sì perchè noi, specialmente al sud, con l’olio abbiamo un rapporto viscerale, l’olio è tradizione, è l’oro delle nostre terre. Per questo, quando ho assaggiato per la prima volta l’olio extravergine biologico “Grottafumata” del mio conterraneo Mauro Cutuli, me ne sono innamorata. Sì perchè l’olio fatto da un siciliano appassionato che ama la sua terra non è solo un olio buono, è un olio che racconta una storia. 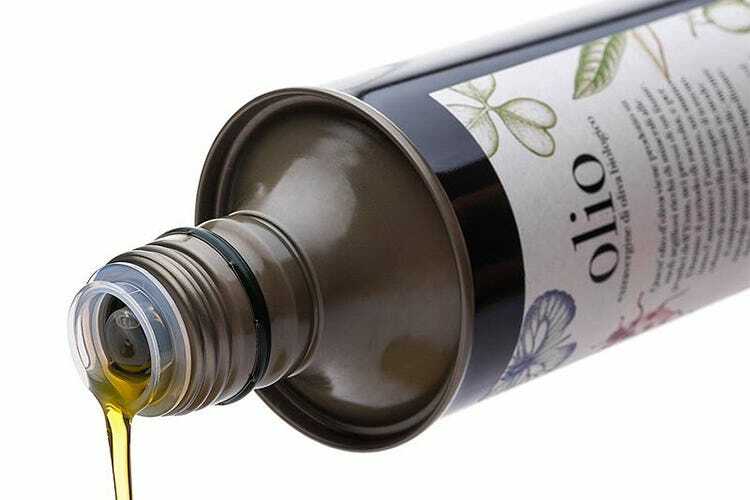 A partire dal packaging un flacone in latta curatissimo con un’etichetta dipinta a mano, l’olio Grottafumata, estratto da olive di alberi di Nocellara Etnea è un olio con grande carattere ed il merito è tutto del territorio: la contrada dalla quale prende il nome si trova a 300 metri sopra il livello del mare, si trova vicino ad un fiume ed il suolo è ricco di minerali come sodio e potassio. Grottafumata è senza agenti chimici e, come in una fiaba, a difendere gli ulivi dai parassiti ci pensano coccinelle e lucertole. Il segreto sta poi nella raccolta rigorosamente fatta a mano come vuole tradizione e nella tecnica di lavorazione ( le olive vengono molite entro quindici ore con una temperatura d’estrazione di 26 gradi per 45 minuti). Non è un caso che Grottafumata sia stato apprezzato da chef del calibro di Massimo Bottura, Davide Oldani e Davide Scabin, lo hanno scelto rinomati ristoranti italiani ed è arrivato nelle case Australiane, Cinesi e Giapponesi e promette di arrivare ancora lontano. Alla luce di questo grande e meritato successo, sono tanto orgogliosa di conoscere personalmente il produttore Mauro Cutuli (di lui vi avevo già parlato a proposito delle sue Cene Contemporanee a Catania) e di aver potuto apprezzare il suo Grottafumata, entrato nella mia cucina e destinato a restarci a lungo. As part of the “Our Italians” series, today we meet Mauro Cutuli, owner of Olio Grottafumata. 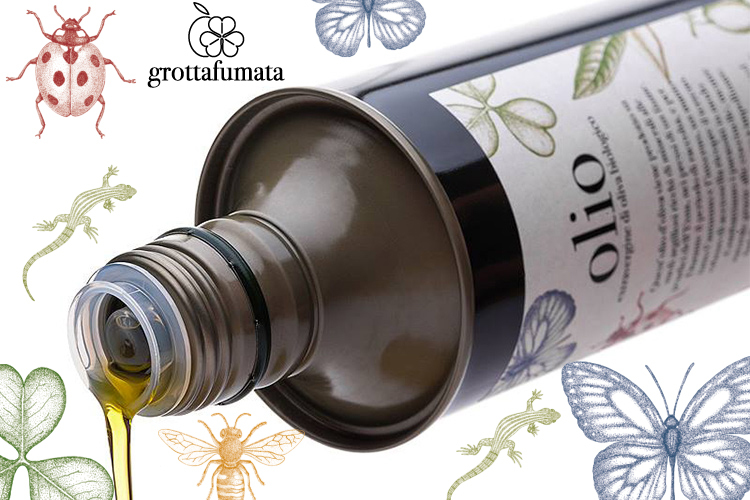 Olio Grottafumata produces organic, extra-virgin olive oil from the Nocellara, Etnea cultivar (olive variety). 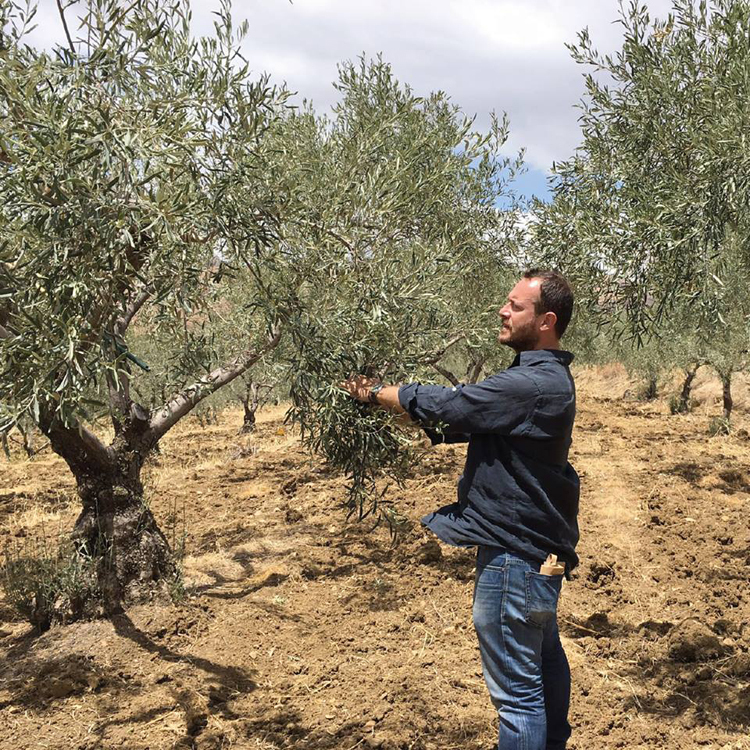 You can often find Mauro working in his olive groves which are planted in the characteristic chalky, clay soil of the Contrada Grottafumata (Randazzo, Sicily). Casa Mia: Tell us how you came to start producing olive oil. Mauro Cutuli: For twenty years, I have been part of the world of small wine producers. I have always appreciated their way of living on the land. These producers are at ease among the vines, in the wine cellar and in some of the most important restaurants in the world. In speaking with my wife a year ago, we agreed that we too could tell a story with our olive grove, allowing consumers to experience the herbal aromas of tomatoes and artichokes, as well as the sweet and flavorful notes which come from the potassium and sodium of the chalky, clay soil characteristic of the Contrada Grottafumata (Randazzo). Since I was a child, this land has always fascinated me. When I look at photos of myself from 35 years ago, I was always among the olive groves and vineyards of nerello mascalese grapes with a hoe in hand or riding a tractor. 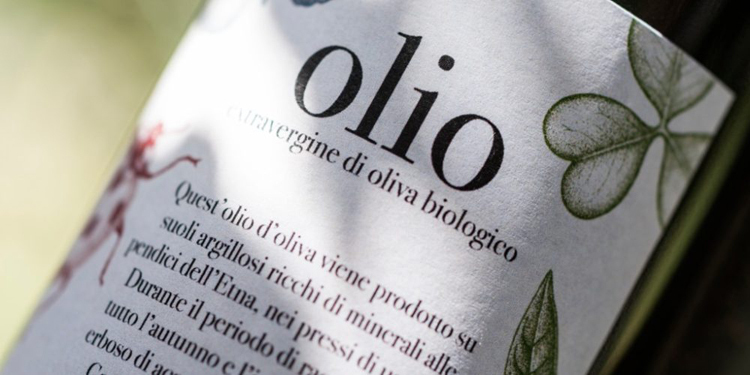 CM: Etna is not universally associated with olive growing. There is more knowledge of the area’s grape and citrus farming. Are you a pioneer in this field, or are we simply misinformed? MC: Even more than oranges (from the plains of the Province of Catania), Etna has been connected to wine production. Its historical ties run deeper than those to olive oil. Our grapes, even more than our wine, became known in Europe for their resistance to phylloxera and for their phenols which they contributed to the wines of Tuscany and Piedmont. I am a pioneer in terms of my oil’s terroir and the contrada to which we belong. CM: Describe how Grottafumata extra-virgin olive oil is produced from harvest to bottling. MC: The approximately 10 hectares of land we own are located at 350 meters above sea level. We begin hand-picking the olives at the beginning of November and the harvest lasts about 30 days. We pick the green olives which have been ripening for a week or two. Within 15 hours of collecting the olives, we grind them for 45 minutes at 25 degrees Celsius (77 degrees Fahrenheit). We choose to have low yields in order to preserve the quality. The olive oil, which we keep in silos topped off with Argon, is decanted three times a year when the moon is waning. We fill the bottles and metal canisters on request. This decision means more work for us but it is important in terms of maintaining the organoleptic properties. We safeguard this both for our private clients and for restaurateurs. I believe in democratic values and I want everyone to have the best possible expression of my product. CM: What is the advantage of hand-picking vs. machine in regards to flavor outcome? MC: The yield doesn’t change. Perhaps, the quality changes but this is a matter of opinion. When using machines to harvest the fruit you risk damaging the plant, including the future drupes. CM: There is debate on the “virginity” of olive oil. Can you help us understand how to protect ourselves as olive oil consumers from fraudulent and reckless olive oil commerce? MC: Virgin and extra-virgin olive oils are catalogued according to their oleic acid content. It’s more of an issue of changing the way we look at olive oil culture. I believe we should start by looking for artisan oils which express their territory. We must reconsider the relationship between olive oil and cooking by starting to think of olive oil as food rather than an anonymous condiment. A drizzle of good olive oil is enough to enhance a dish, instead of dishes soaked in poor quality oil. The last place I would buy olive oil is in large-scale supermarkets. CM: Your olive oil is being used in high profile dining destinations, top chefs are drizzling it on their Michelin starred dishes. What helped place your product in the limelight, beside quality and integrity? MC: The success of my olive oil comes from my approach toward the land. I believe that the human dimension in agriculture should support nature instead of working against it. All around the world, we are ingesting high levels of poison by way of commonly-eaten foods created in laboratories, which are making us weaker. Important chefs appreciate my olive oil because they understand that I am protecting this unique territory (which includes the largest active volcano in Europe), creating a healthy and delicious final product. CM: What dishes would you use serve it with/use it for? MC: One of the characteristics of Grottafumata olive oil is its versatility. On salads, cooked vegetables, fish or steak tartare, soups, warm bread, pizza, in sweet doughs… in whatever situation it enhances the dish. This is one of the “technical” reasons why [our oil] is requested by chefs and cooks. CM: Where can our readers purchase/taste your olive oil? Can you ship to the U.S.? MC: We are currently building a sales network in Italy and next year we plan to be present in other European countries, as well as those outside the EU. We are able to send our products anywhere around the world thanks to the online interface on our website. CM: Is there something that you’d like our readers to know that we haven’t asked you? MC: I would like to share the grassy fields, the Salso River and Mount Etna, which overlook the olive grove. My wife and I would be delighted to present our land to those who buy Grottrafumata olive oil. Photos of olive oil bottles by Alessandro Castagna. L'oro dell'Etna, l'Olio EVO Grottafumata.